Ever since last spring when Allie Hasson and I created these colorful write-in party invitations, I've been jazzed about combining digital and letterpress for paper goodies of all kinds. In fact, my 2018 Christmas card collection also boasted both forms of printing, and I was so pleased with the design flexibility this allowed. 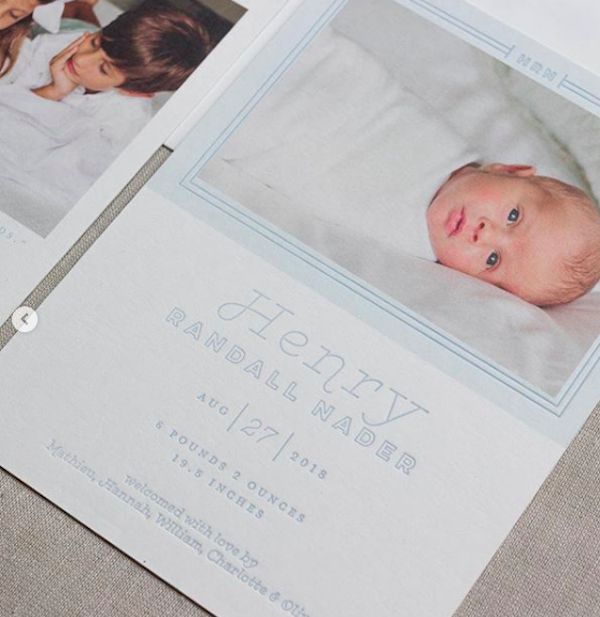 I love being able to offer photo printing directly on the paper along with more colorful designs—all in combination with the crisp, clean effect of letterpress printing. Another goal for this year is to launch a small collection of semi-custom birth announcements that will provide that same effect: your precious baby photos + deep, textured detail work. You don’t have to choose between the two! I got the chance to test this method out with a beautiful design by Katie Beth Owens of The Good Stuff late last year. 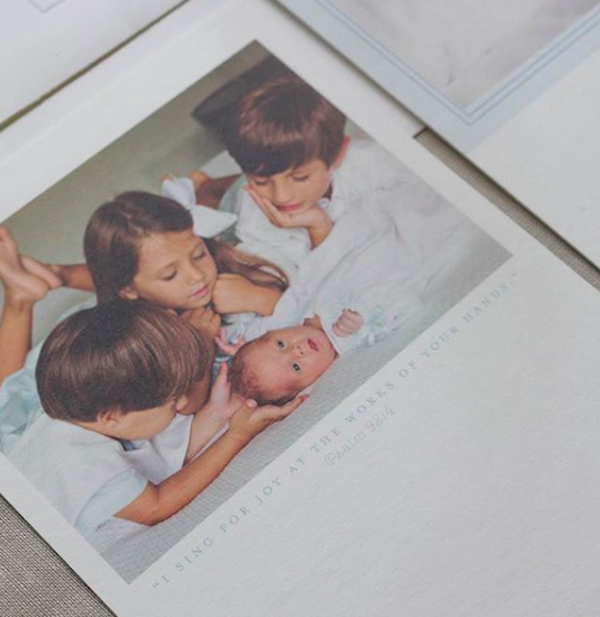 Not only did this sweet design feature a picture of the family's newest addition on front, we were able to include a second photo of the whole family on the double-thick card backside. This is just one of the benefits of combining printing methods, and I love the extra layer of personalization that it allows. Another benefit of designing this way is that it allows for a flood of color (see photo below). This means that we can digitally print an entire area with color—something that’s not well-suited for letterpress, which typically really shines with fine lines (ie: text). Lastly, I really love the option of designing with more COLOR. Letterpress is a time intensive process, and each color of a design requires a separate run through the press. My first business card design was 4-color. After printing my first set of cards, I did a slight redesign to make sure I never had to do that again ;) The result is beautiful, but it’s a labor of love. Printing digitally provides another way to add dimension to artwork without having to print separate layers of color. As you can see in the image below, it also allows for different kinds of imagery (ie: watercolor) that aren’t suitable for the letterpress method. As I’m designing my line of semi-custom announcements, I’d love to hear if there are any other things you’d like to see in the collection. Feel free to contact me here or leave a comment below! It’s everywhere. Everyone you know is Marie Kondo-ing every square inch of their lives. No closet or junk drawer is safe! I totally drank the kool-aid and went through my possessions after binge watching the series last weekend. The next room I’ve got to tackle is my little office. This is where I keep my samples and ready-to-ship product as well as a personal file drawer—aka holding cell for the piles of bills and records that I’ve allowed to accumulate over the past several years. One of the reasons it’s easy for my piles of paper to get out of control is that I just that—there are too many piles. I know I’ll have the energy to tackle the organization of my papers if I’m better about making upfront decisions about whether or not I need to keep things and where they should ultimately “live” should I deem them keep-able. Or, if they just need to live with me for a little while until they’ve served their purpose, they’ll be put in an appropriate location for that to happen. If I’m going through a stack of mail and I know most of the papers belong in the recycling bin, I’ll go ahead and take them there. If there are wedding invitations or other pieces that need a response, I’ll make a pile for “to-dos.” This pile can live on my desk. When I’ve send in reply cards, entered details into my calendar, paid my bills, I can make another trip to the recycle bin to get rid of papers I don’t need. Invitations usually make their way to the fridge where I display them until after the event has passed. Bins and boxes are meant to help curate. Whatever fits in them is what should live in them. If papers are bulging out of my file folders so that the drawer won’t close, it’s time to go through and see what stacks I don’t actually need anymore. If my bin of handwritten letters is filled to the overflowing, I can probably go through and remove some of the old postcards from when I worked as a camp counselor over ten years ago. The confines of a container should dictate more editing—what should go and what should stay. I’m a serial purger. Just ask my husband. He’s constantly trying to rescue things from my Goodwill piles and told me that my watching Tidying Up was like someone with an eating disorder saying they need to go on a diet (yikes). For those of us that love to rid our homes of all the stuff, let’s remember that it’s important to hang on to a few of the sentimental things that will serve us and our families down the line. Like my “about” page reads: Will our grandkids be reading our emails when we’re long gone? Doubtful. But, they may love spending an afternoon going through the letters we used to write each other or the Christmas cards that we sent out each year. I don't want to erase my family history, but instead leave a purposeful paper trail of the milestones and moments that matter (while purging the ones that don’t). With that said, I want to find ways to preserve those meaningful papers that I’ve decided to keep. I love the idea of framing wedding invitations and birth announcements. This year, I ordered a couple of extra Christmas cards so that I could paste one into my daughter’s Promptly journal with a note about our first year as a family of three. It’s interesting being in the business of paper in this digital age. And for someone who gets serious a thrill from emptying a stack of papers into the recycling bin, the irony is not lost on me. The point is not to delete the past with our papers. It’s to ruthlessly edit what we keep so that we can leave a *thoughtful* paper trail for our future selves and our families.